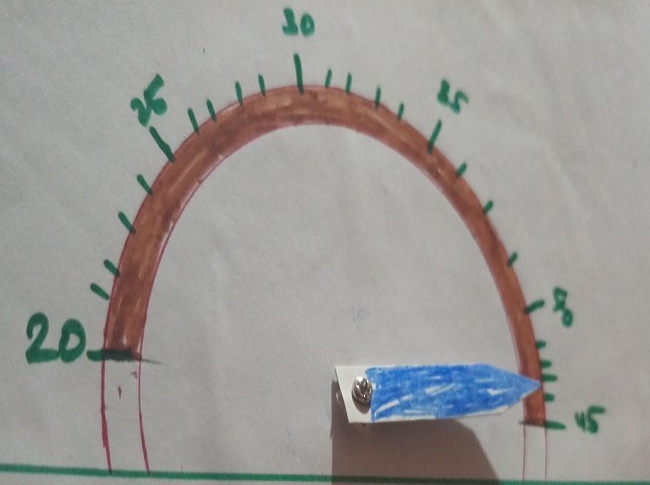 In this article, I am going to show how we can create a simple temperature gauge. By the end of this article, you will be able to make your own simple temperature gauge. 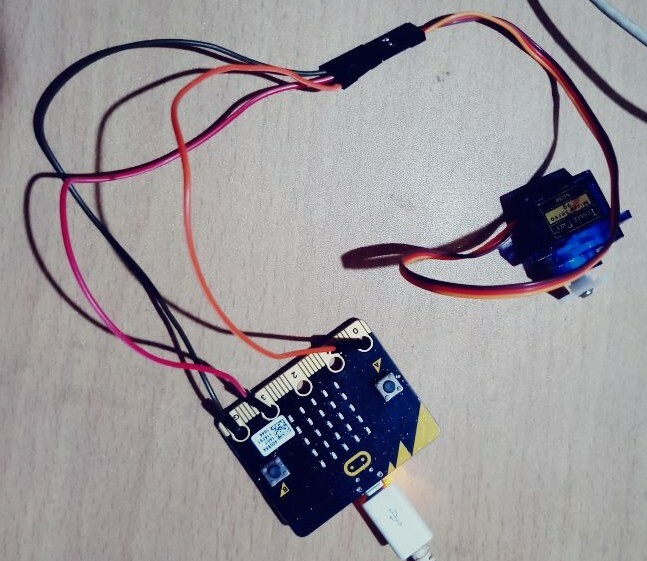 I suggest you go through the following articles where I have covered how to read temperature and how to drive servo using Micro:Bit; I am going to combine these two things and make a temperature gauge. So, if you go through these two articles, you will have a clear idea of what I am doing and how I am doing it. So, let's start with the designing part and then we will go to the coding part. What you need to do is to cut the cardboard paper and use a compass to draw a half circle on it and label it with the number range you want, as in the below image. And what else you need to do is make a hole so that we will be able to use something like a needle for pointing purposes. Now, let us see the connection part. The connection is same as we have done in the previous article How to Drive servo; here's how to do it. That's all. Now, let us see the coding part. So for the coding part, we will use block coding. 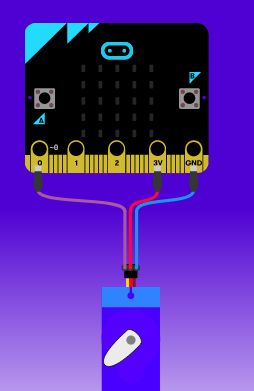 Go to makecode.microbit.org and create a new project. Here also, we're going to use temperature variable for reading the temperature and we will apply some logic also for decision making purposes. Follow the steps and you will get it. Go to makecode.microbit.org and create a new project and delete the start block; however, if you don't delete it, you will not face any problem. Go to the variable and choose the "set item" block, place it after the "forever" block, and rename the item variable to temperature. Now, go to input and choose a temperature block and attach it to "set temperature to variable" like this. What we need to do now is to replace true of iF then ELSE block to 0=0 block and place temperature variable there. We're going to set room temperature to something like 20 degrees. So according to the above code, if the temperature is less than 20, then we're assigning/setting the temperature variable to 20. If not and the temperature is more than 35 degrees, then we're setting the temperature to 35. You can choose any number you want based on the temperature at your place. 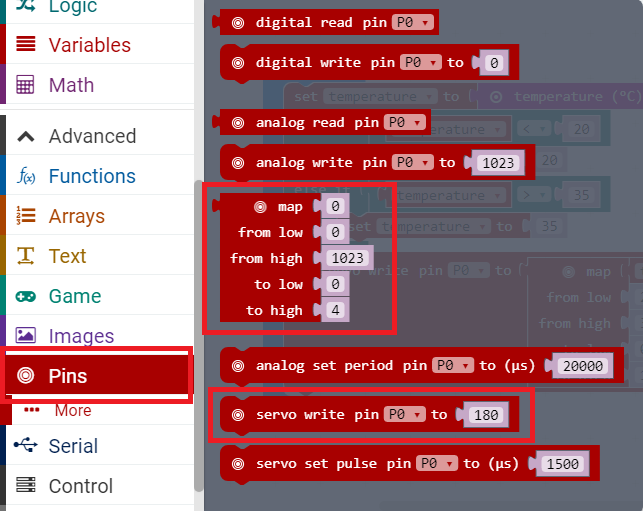 Go to pins and then choose map block and servo write block. That's all -- now just download and copy to the MICROBIT DRIVE. And try to heat the CPU and you will see th servo adjusting according to temperature. You can see a demo HERE . In this demo I have used different values and then adjusted the servo according to those values.